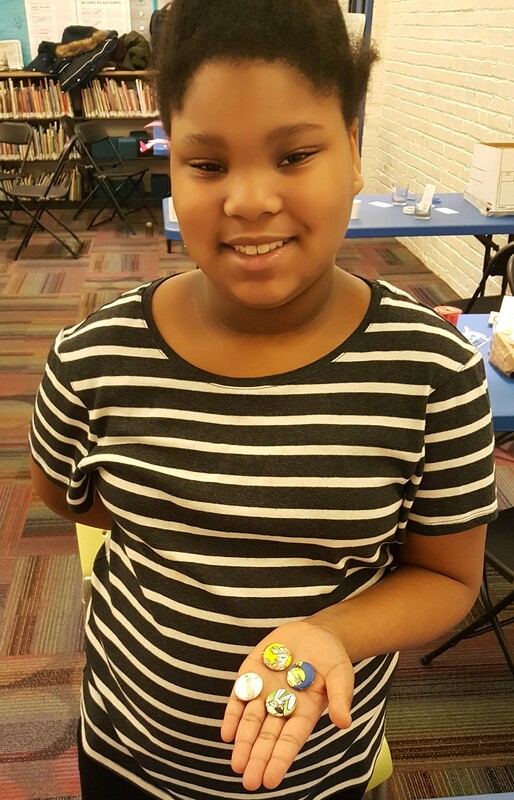 Our work at Niles Library was featured in WSBT 22! Check out the video and article here. A local library is transforming the way people can use it. The University of Michigan is now partnering with the Niles Library for a new project. The program is designed to build skills and relationships. It’s no secret libraries are trying to adapt to the changing world. At this library, that means more knowledge is being absorbed by seeing and doing. Watch a report from WSBT 22’s Caroline Torie in the video above. On October 18th, Kristin Fontichiaro and Benzonia Library staff members met with Senator Darwin Booher to talk about MML’s relationship with rural libraries through the University of Michigan School of Information. Mark Rivett created a news event on the University of Michigan’s Government Relations page, which can be found here! The news event with wonderful videos can be found below. 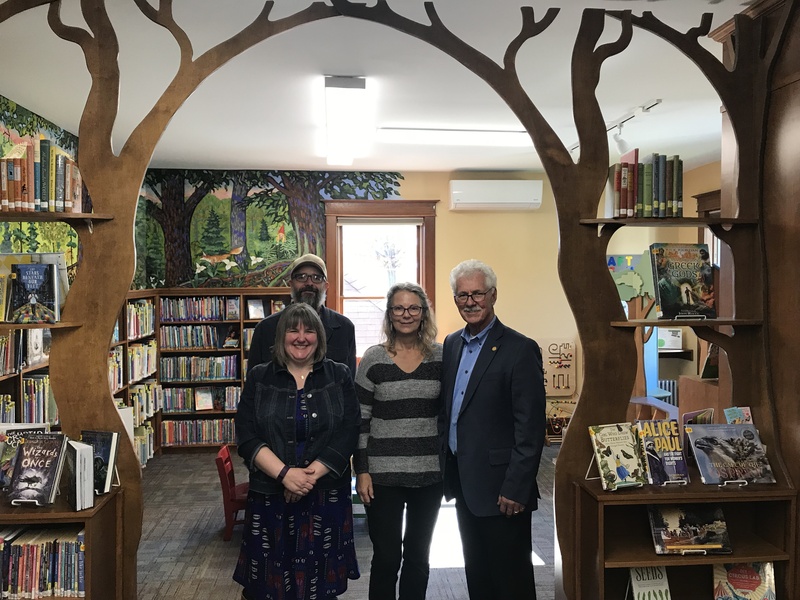 Today, Senator Darwin Booher from Evart, Michigan, visited the Benzonia Library to learn more about the UM School of Information‘s efforts to strengthen relationships with local rural libraries. Here are two UM videos highlighted their efforts in Benzonia. Lucky 13! The 13 Amazing Libraries We’ve Worked With! Over the years, MML had the pleasure of working with 13 wonderful libraries! 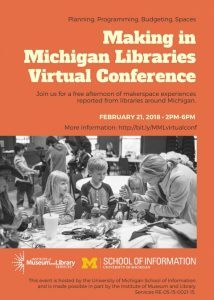 From Peter White Public Library in the UP to Niles District Library in the Southwest MML has been partnering with libraries all over Michigan! We’re honored to have been able to work with and continue to work with so many wonderful libraries across Michigan. Thank you, to our 13 fabulous libraries! 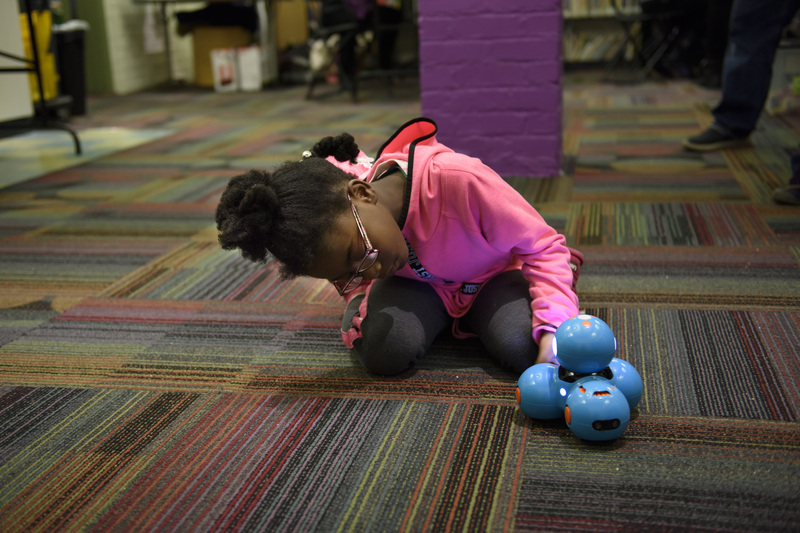 School Library Journal Wrote a Great Article About MML! 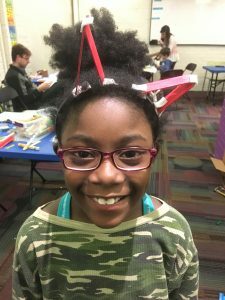 School Library Journal (SLJ) wrote an article about MML’s resourceful low expense projects and events! This article was published in November 2017, but is just as relevant today. To view the article on SLJ’s site check it out here! Clockwise from top left: Through a Michigan Makers partnership, coordinated by Kristin Fontichiaro, an elementary student repurposes junk materials to make something new; building a cardboard ATM machine at the Stewart Middle Magnet School in Tampa, FL; a cardboard city at a Redwood City (CA) Library Foundation event. 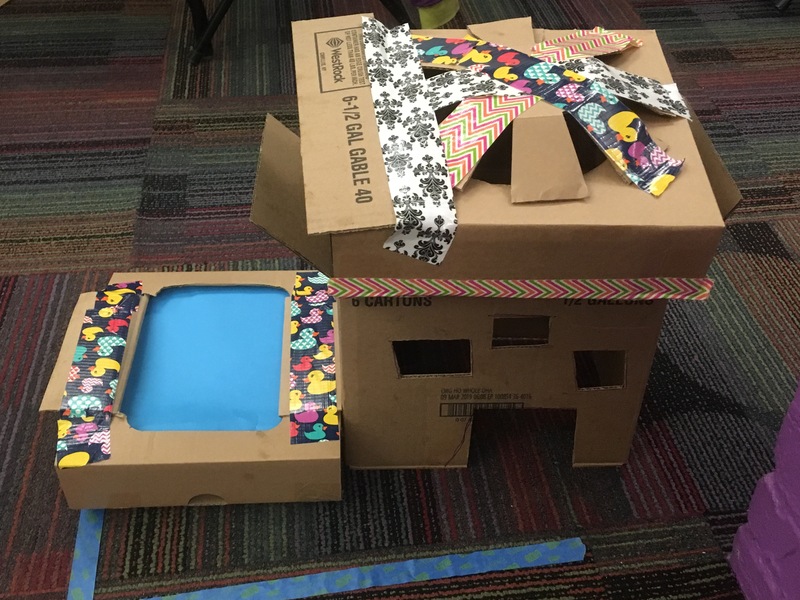 High-tech projects involving 3-D printers, laser cutters, and fancy video equipment are usually an easy draw for students, but ideas that involve cardboard, straws, and T-shirts can also deliver a big burst of STEAM without breaking the bank. We asked librarians and other experts around the country to share the most popular low-cost making projects they’ve seen or done. Here are some to try this year. 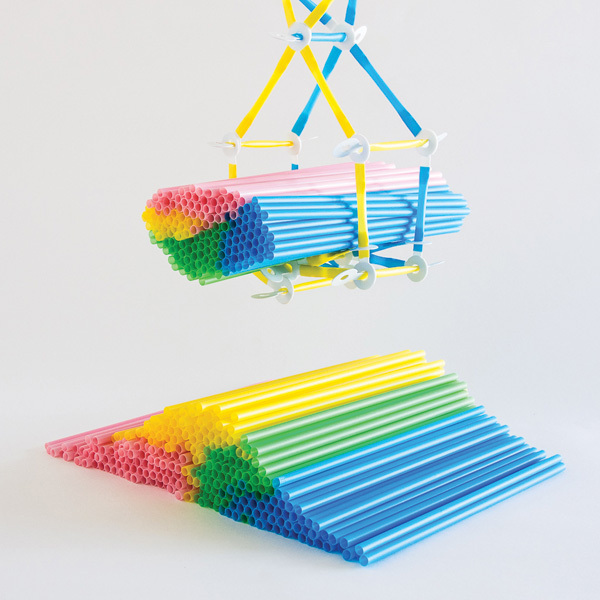 Straws lend themselves to lightweight building and are surprisingly resilient Strawbees, which are stronger and more flexible than regular straws, are designed for inexpensive prototyping activities; a pack of 200 colorful Strawbees costs $10. 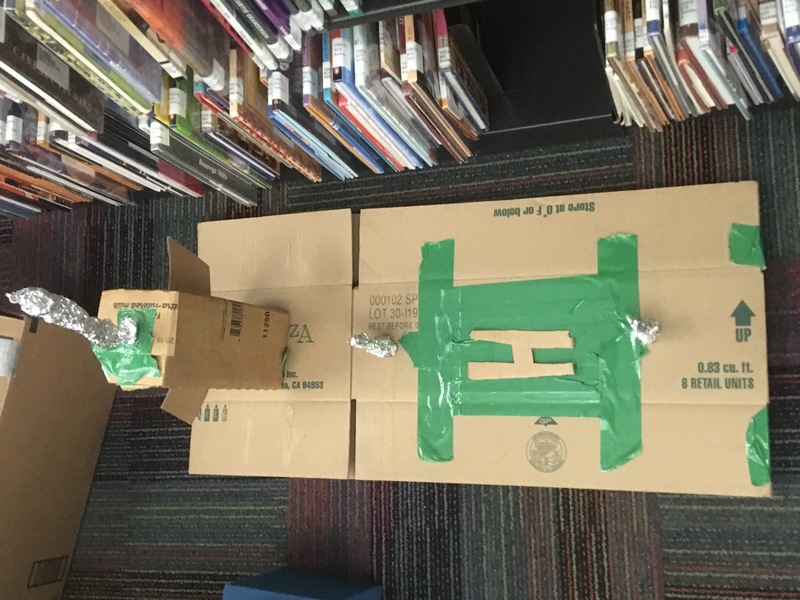 “I have seen students build catapult projects, engineering projects, and weight-bearing projects,” says Heather Moorefield-Lang, associate professor at the School of Library Information Science at the University of South Carolina. “Afterward, you just break them apart and start something new. 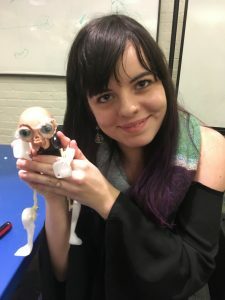 They just keep giving.” Strawbee connectors are available in a kit for $20; students can also scan and print more on a 3-D printer, suggests Moorefield-Lang. 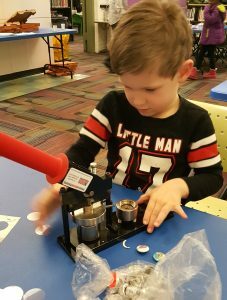 If your library is equipped with a die-cutter, you can create your own connectors from old plastic containers (#2 and #4 plastics work best). Adult-size, secondhand T-shirts can turn into all sorts of togs with a pair of scissors. “Kids can wriggle through the neck holes of an adult shirt and, using the ribbing as a waistband, create a T-skirt,” says Kristin Fontichiaro, clinical associate professor at the University of Michigan’s School of Information. She suggests cutting off the hem of a second shirt to make belts or braiding the strips to use as a hairpiece. Turn T-shirts into knights’ tabards by cutting a line straight down the shirt from the shoulder to the bottom, or create capes by cutting off the shirt front from the shoulder seams, leaving the ribbing intact. Discarded sleeves can become knit caps. Then kids can dress up in all these new garments to enact scenes from their favorite books. Fontichiaro recommends the activity for third graders on up; students need to be able to manipulate fabric scissors. When then nine-year-old Caine Monroy built an arcade entirely of cardboard, he launched a movement and a website. Students can join this year’s global challenge—or be more open-ended and design their projects. 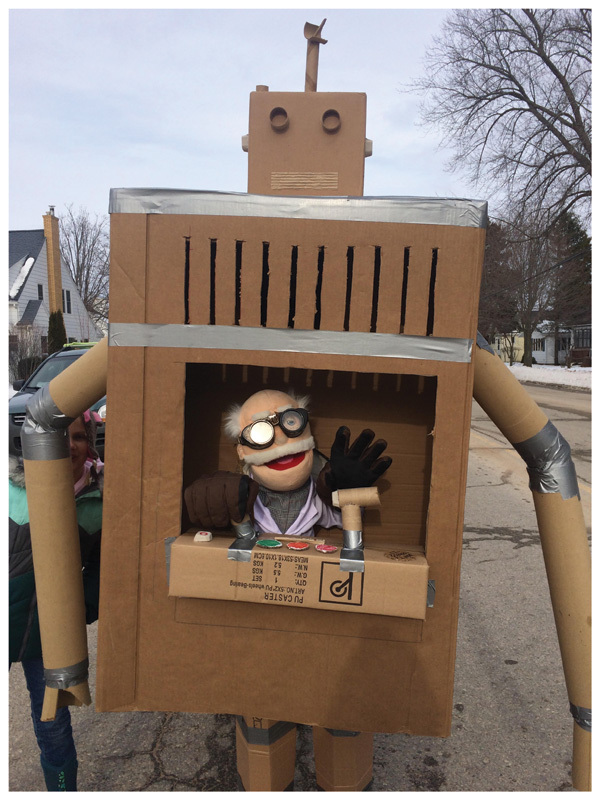 To start, you’ll need to provide cardboard, glue guns or duct tape, paint or markers, and some cardboard-cutters. 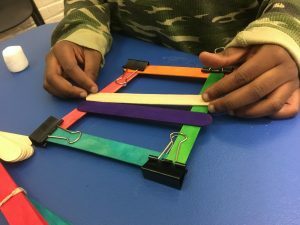 Robert Pronovost, a maker space consultant and founder of EmpowerMINT, dedicated to empowering students through making and innovation, likes to have students work with Makedo’s kid-friendly saws, which are included in a toolkit ($12.95 each, make.do). Diana Rendina, media specialist at Tampa (FL) Preparatory School, also recommends a battery-operated cutter from Skil (about $40 on Amazon.com). 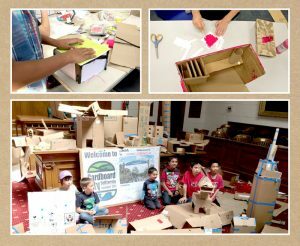 Pronovost gets kids’ creative juices flowing by giving them stacks of cardboard, tape, butcher paper, and tools to build a cardboard city. Librarians can start by constructing one building, with or without student help, and have them work alone or in groups to add on. Spurring them on with questions leads to planning and innovation: Does this city need an airport? Would hotels be useful? What about a reservoir or city hall? The beauty of this project is that students of all ages, even preschoolers, can join in. 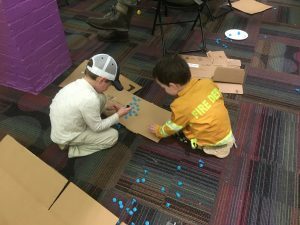 Heather Lister, a consultant for Mackin Educational Resources and a former teacher librarian, put a new spin on the cardboard challenge by giving her students the chance to create a plaything for her then two-year-old son. They asked him questions about his likes and dislikes and then crafted toys, including a marble run. The only parameter: every part of their creation had to be DIY. “What I really like about this project is that it not only focused on the invention and design process, but involved research and knowing your audience,” Lister says. She also liked that kids were creating for someone other than themselves, fostering empathy, and suggests that students could design for one another or for kids in other classes. 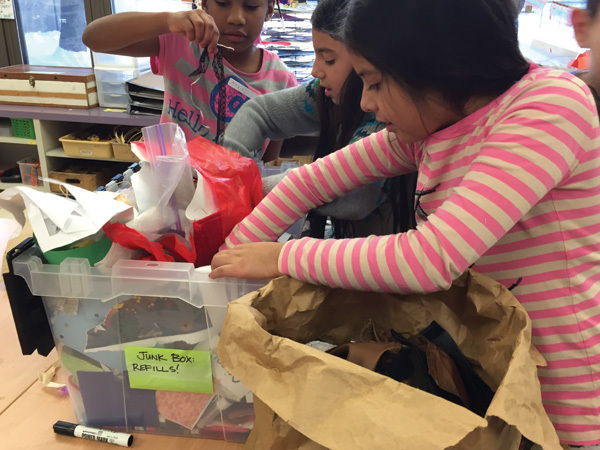 Michigan Makers participants sort through recycled materials to create gifts. Free building material is all around, if you just look: It’s not too difficult to collect empty cereal or cracker boxes, toilet paper tubes, yogurt containers, broken toys, and more. Then add scissors, tape, glue, and a stapler to your stash. 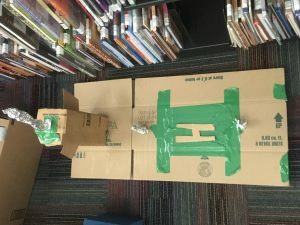 “Students can create the slowest marble maze or board games, prototype the next holiday must-have toy, or invent their own creations,” says Fontichiaro. 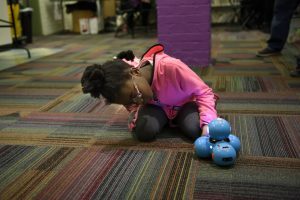 Best of all, preschoolers on up will be able to make something—and tap into their problem-solving and design skills. Play-Doh plus LED lights, a nine-volt battery, some wires (repurposed from old tech), and alligator clips can give kids the chance to fashion light-’em-up creations—including flags, animals, and motor circuits, among other projects. Pronovost suggests checking out SquishyCircuits.com for ideas, along with instructions for making your own conductive or insulating dough. “Most schools have a closet somewhere that has a ton of old technology,” says Lister, whose own school had desktop computers dating back decades. Kids can dismantle old computers and repurpose what they find inside. One of her students made an exhaust system from the fans found inside the computers. 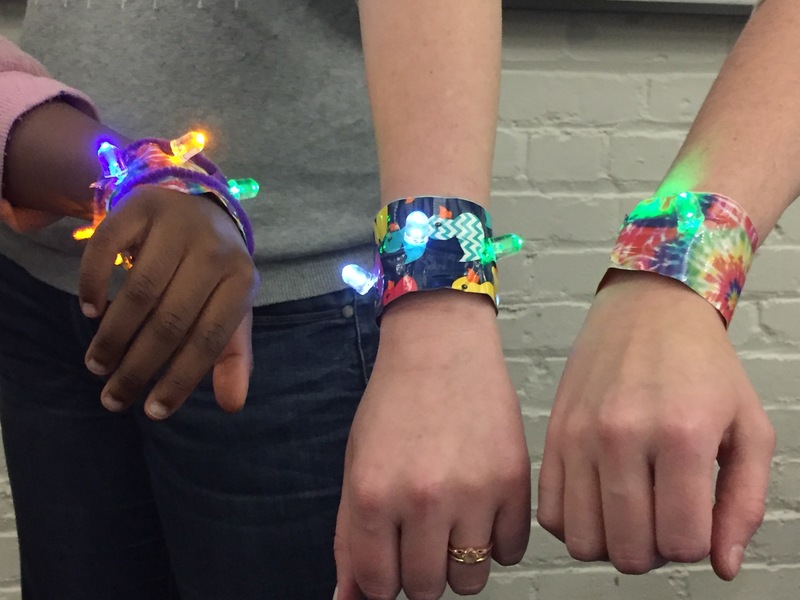 Lister repurposed the wires to serve as conductive material for other projects—and for making cool jewelry. Not all schools have tech closets; if that’s the case, parents and community members are usually happy to donate. You’ll probably get a number of obsolete objects, including camcorders and cassette players. Toothbrushes make great little robots, especially when you go to a dollar store and buy packs of battery-operated toothbrushes, says Lister. Snap the head off the toothbrush and find the vibration motor inside the motor. Then tape the vibration motor and battery on top of the bristles. Make sure the bristles are angled, Lister notes—if they aren’t, you can angle them by placing a heavy book on the bristles overnight. Bots can run races or be used as drawing machines by attaching markers. 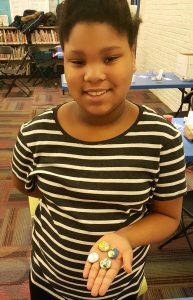 Students can make amazing creations with heat-fusible plastic beads known as Perler beads, says Rendina. She buys them from Amazon, but cheap ones are also available at Walmart. Kids can use plain, clear pegboards (also at Amazon) to create their own designs or depict their favorite fictional characters, using free, downloadable templates online. 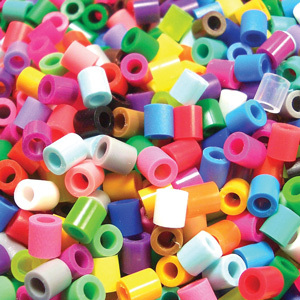 After the students have finished their bead artworks, place parchment paper over the designs and iron the beads to fuse them together. Rendina ironed her students’ creations and trained a few responsible eighth graders to help out. This $99 digital cutting tool was originally designed for scrapbookers, but Fontichiaro also likes the fact that it doubles as a low-budget vinyl cutter that’s easy for children and grown-ups to use. Students can cut shapes to decorate laptop lids or smartphone shields. Fontichiaro also suggests that kids cut stencils from self-adhesive paper (like Contact) and use them, along with fabric paint or etching cream, to create designs on T-shirts or glassware gifts. As for materials, glassware and T-shirts are often available for $1 or less at secondhand stores, she notes. Pizza boxes transformed into green screens. 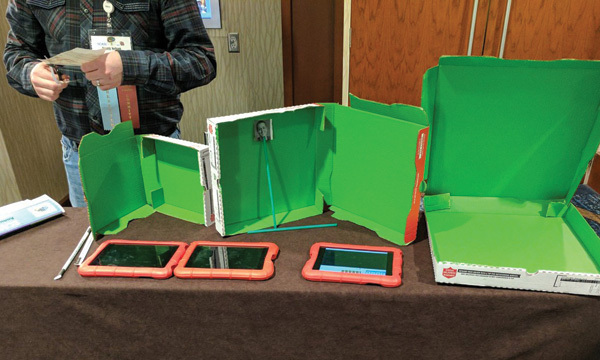 Pizza boxes can make excellent portable green screens, as Travis Nelson, library media consultant at Richland County School District One in Columbia, SC, demonstrated to Moorefield-Lang. Nelson starts by painting the interior (top and bottom) of the boxes green. Then he attaches little characters to green straws procured from Starbucks and uses the Green Screen by Do Ink app ($2.99, iTunes) to make videos of puppet shows and stories. Looking for more ideas? 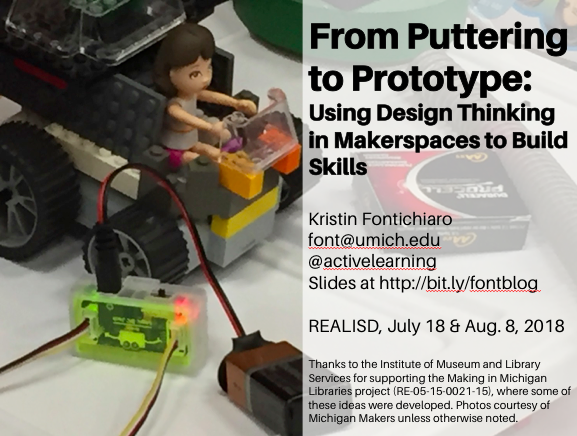 Check out Make It @ Your Library, where projects can be filtered by cost, suggests Lister. The University of Michigan News Wrote an Article About Us! 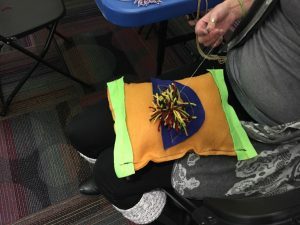 The University of Michigan News wrote a lovely article about Making in Michigan Libraries: Customizing Community Libraries! The article covers our partnerships with Benzonia Public Library and Niles District Library. These objectives are why we have continued to do this work. We’re so thankful for our wonderful partnerships and all the opportunities we’ve been given! ANN ARBOR—The noise level at the Niles District Library is not very library-like some days. Voices are well above whispers. Things look out of place and the tables are a tableau of objects lying in pieces, patrons busily studying them, figuring out how they work and what other ways they can be used. Local librarians are the idea people behind the projects. The School of Information assists the libraries as they determine what events most resonate, launch them and then run with them on their own—or come up with new ones. They collaborate with the School of Information, which provides assistance and funding from the Institute of Museum and Library Services and the School of Information’s Founders Fund. 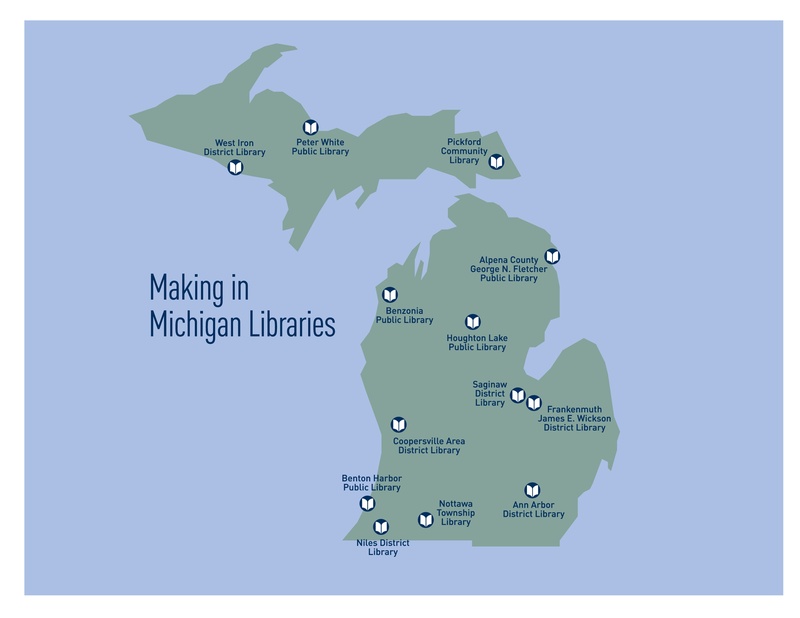 The Library of Michigan has helped select sites and provided insight as projects were developed and implemented.